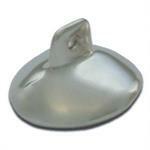 Silver Plated Eye Shields protect the patient’s lens during radiation therapy treatments. They come in four different sizes and are highly polished. The small and medium solid lead shields fit under the eyelid to protect the lens, while permitting irradiation to the entire thickness and width of the eyelids in the treatment of superficial basal cell carcinomas of the skin. Large solid lead shields are used when areas surrounding the eyes require irradiation, in which case, the shields are placed over the lid. When only a portion of the eyelid requires irradiation, an extra large shield with a window is properly placed over the eyelid.